Blood clots are dangerous for the health of the brain. One of the principle causes of blood clots is an injury to the vessels in the brain. A blot clot in the brain can lead to Ischemic stroke. The stroke is caused when the artery to the brain does not get adequate oxygen-rich blood and nutrients as the blood clot blocks it. When a particular portion of the brain is starved for blood, a person suffers from a brain stroke. Many times presence of blood clot can also lead to the buildup of carbon dioxide and cellular waste as in the absence of adequate oxygen; the brain loses its capacity to clear the waste properly. Due to this, the cells surrounding the blockage die and the neurons present in the brain stop working altogether damaging the body throughout. A blood clot can be life-threatening. Hence, if you feel that you have a blood clot in the brain immediate treatment becomes necessary. When the brain, neck or head are injured or are traumatized, it can lead to a formation of blood clots. The clots are formed when the bleeding occurs in the brain and the skull. Actually, the formation of a blood clot is a preventive measure by the body to stop the bleeding, which ultimately puts pressure on the area surrounding the brain tissue. One of the causes of blood clots is trauma to the head that leads to blood clots formation outside the brain. Such a blood clot breaks loose and positions itself in the brain causing an ischemic stroke. Many times the blood clots travel from the other parts of the body and reach the blood vessels in the brain causing blockage and leading to cerebral embolism or embolic stroke. More often during their travel these blood clots first cause damage to the other body parts before reaching the brain and hence chances of their detection earlier is possible. This condition is also known as atherosclerosis and can increase the likelihood of a person to develop a blood clot in the brain. It is known as one of the most common causes of blood clots. Hardened arteries can tear off when they are pumping blood leading to the formation of a clot in the damaged area. It prevents the blood from leaking but can block the supply of blood to the narrowed artery leading do damage to the cells surrounding the affected area. Superficial vein inflammation is one of the major causes of blood clots. When the vein is damaged because of acute trauma injury, it gets inflamed and catches bacterial infection. The inflammation reduces the blood supply to the surrounding area. Since the damaged area becomes vulnerable to leakage, a blood clot is formed stopping the supply of blood to the surrounding areas. Note: Women using oral contraceptives are more vulnerable to blood clotting. Also women, who are above the age group of 35 years, have a family history of blood clots or smoke and use contraceptive are at extremely high risk of developing clots in the blood. If a headache is caused due to a blood clot, the patient will experience a headache on only one side where the clot has been formed. A headache worsens when you move the head, sneeze or do physical activity. If you have a blood clot in the brain, you may begin to have slurred while you speak. A patient with blood clot often finds it difficult to talk. It is more so if the blood clot is located to the left side of the brain. Patients with a blood clot in the brain take longer to take decision and think as their thinking capacity is affected. They may also feel confused and require a longer time than normal to understand even simple things. The presence of blood clot can change your personality, and you may suddenly start behaving like a manic. Sometimes normally energetic people start feeling fatigued and tense. A blood clot is associated with frequent dizziness bouts and temporary blindness. Symptoms of depression and blood clots are sometimes almost similar. Hence, many times a patient of depression is asked to check for blood clots to make sure that his brain is receiving oxygen in the right amount. Patients with a blood clot in the brain find it difficult to carry on their regular activities with normal coordination that they are used to. It is because due to the blood clot the brain loses its ability to coordinate the simple abilities such as transfer of objects from one hand to the other. One of the causes of seizures is blood clots. If these seizures last more than few minutes, it is an indication of a serious condition. In many cases, blood clots can cause paralysis, thereby paralyzing the body. It may easily affect the face, leg, and arm of a person. Also known as a mini-stroke, it leads to dysfunction of one body side and if the conditions worsen, can also lead to body stroke. If the doctors suspect the presence of a blood clot in the brain, they may suggest a CT or MRI scan immediately. 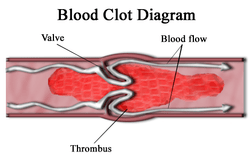 As a mode of treatment, anti-coagulants such as aspirin are prescribed for dissolving the clot. The caregiver at times can also place the patient on a regime of aspirin to prevent the formation of a new clot. However, patients with hypertension need to be cautious while taking any form of medicines. Surgical removal of clots can be advised in some cases when the doctors are not assured of the effectiveness of a medication. Key preventive measures for blood clots include no smoking, remain physically active and maintain a normal weight. Managing any conditions such as heart diseases is also important to ensure that the causes of blood clots are minimized.